A Lego League Robotics Club from South Sioux City, Nebraska had a task to look for local issues and possible solutions, then present their findings to a group. The club members are all 5th graders this school year. SOAR learned from Woodbury County Conservation naturalist, Theresa Kruid, that they visited the Dorothy Pecaut Nature Center in the fall 2016. Theresa talked with the club members about different current issues facing wildlife: eagles and lead poisoning, ornate box turtle and bullsnake habitat loss, insect pollinators, monarch butterflies, and a few others. The club members then had to choose which issue / animal they wanted to research and study. Theresa reported that the club members chose eagles and all the research and information gathering was done themselves. The Lego League Robotics Club presented a short program at the end of January 2017 about the effects of lead poisoning in bald eagles to the Woodbury County Conservation Board members, park staff, and nature center staff. 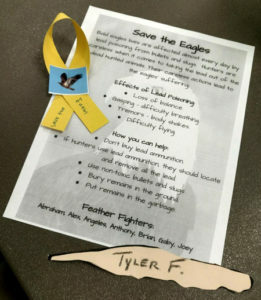 The students handed out paper feathers for all present to sign as a pledge of commitment to the cause. While the solutions club members came up with are what is out in literature, we know that a couple of these are not practical or allowed in many places. Regardless, great job! We love the idea of signing a “feather of commitment.” I hope the club members realize that when someone copies your idea, that is a very good compliment! **UPDATE 13 February 2017 – The teacher working with this club sent word to Theresa at Woodbury CCB that the club’s presentation was selected from their region to go to the state contest on 18 February in Omaha.